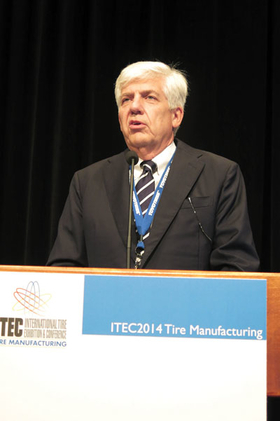 James Hawk, chairman of Toyo Tire Holdings of Americas Inc., delivers the keynote address at the International Tire & Exhibition Conference in Akron on Sept. 10. 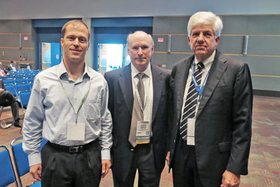 James Hawk (right), chairman of Toyo Tire Holdings of Americas, poses with Charles Ginman (left), Ford Motor Co.'s global technical expert for tires, and Steve Wesner, senior director, quality, for Toyo. Hawk served as ITEC's keynote speaker.